I’ve discovered Valentine’s Day is really much more fun with kids. No outlandish romantic ideals to be crushed. No overpriced dinners for two. Just a fun day where (hopefully!) everyone feels loved, with a small treat at each person’s spot at the dinner table. And as much red or heart-shaped food as I can possibly come up with. It’s much louder around here than it used to be, but we wouldn’t trade it. Bear Hugs: Romantically Ridiculous Animal Rhymes by Karma Wilson and Suzanne Watts — a collection of funny, clever poems about “romantically ridiculous” animals. This book makes me smile every time I read it. My Heart is Like a Zoo by Michael Hall — nicely written, but my favorite thing is the illustrations. 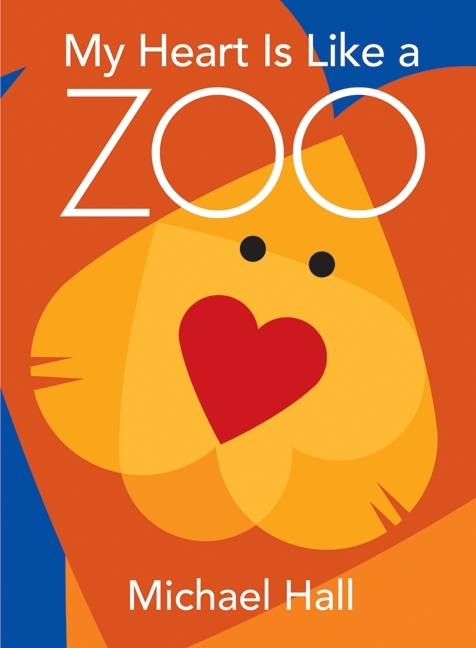 Each zoo animal in the story is made from hearts in various sizes and colors. We like to read and then make animal valentines of our own to give to people. 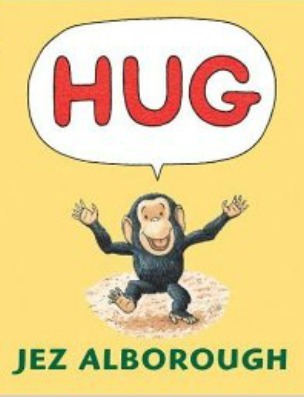 Hug by Jezz Alborough — a wonderful book for very small children. There are three words total, but by the end, we’re all sympathizing with the little chimp, who finally finds his parents to give him exactly what he needs. How Do I Love You? by P.K. Hallinan — such a great, reassuring message to little kids that we love them, on both their best and very worst days and all those in between. 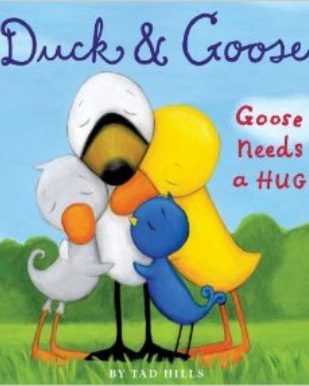 Duck & Goose: Goose Needs a Hug by Tad Hills — Duck and Goose are one of my favorite children’s book duos (behind Frog and Toad, but I think before George and Martha…). And when Goose needs a hug — well, it’s hilarious shenanigans all around. How Do Dinosaurs Say I Love You? by Jane Yolen and Mark Teague — the “How Do Dinosaurs…” is another great series, and this book is right up there. The Runaway Bunny by Margaret Wise Brown — another beautifully reassuring story for kids that shows the depth of a mother’s love for her baby bunny. Happy Valentine’s Day, Mouse! by Laura Numeroff — the mouse from “If You Give a Mouse a Cookie,” realizes that he loves all his friends for different reasons. And — surprise! They love him right back. I Love You: A Rebus Poem by Jean Marzollo and Suse Macdonald — this one is great for almost-readers, because part of the story is told in pictures. And it all rhymes. Thank you SO much for not linking your books to Amazon. This is a great list – sharing! I MUST get the book with the animals made of hearts! Thank you so much for linking into the Kid Lit Blog Hop! I’m following your Facebook and Twitter. I hope you’ll join us again for the hop in March! the animal hearts make great valentines to give out! We love it…thanks for stopping by! Great selections..now I definitely have to read the one with the poems…Greetings from California… I am stopping by also from the Kid Lit Blog Hop. Stopping by from the Kid Lit Blog Hop! 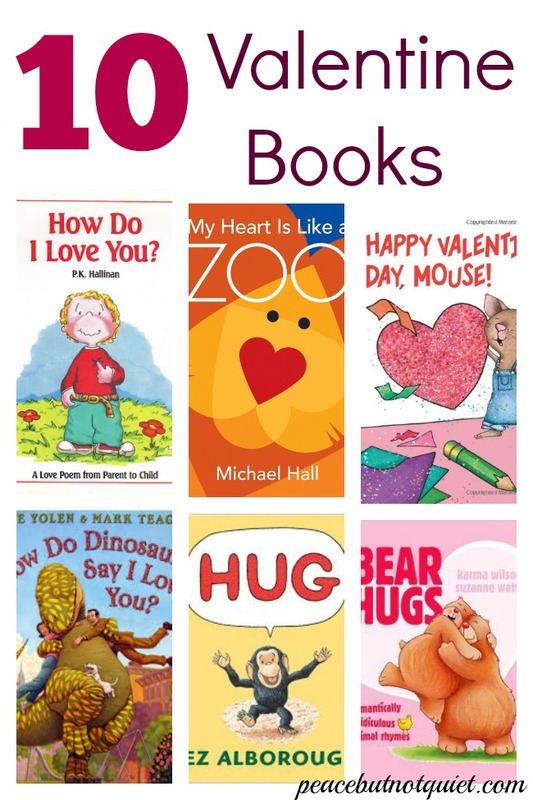 I was actually thinking about going to the library to look for Valentine’s day books for my 4 yr. old, and you just made my job so much easier. 🙂 Thanks for sharing.